This may be the best thing since dispensed pez. 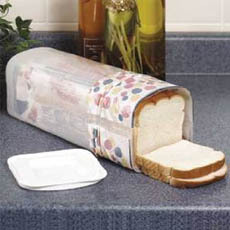 The Bread Buddy keeps your bread fresh and dispenses one slice of bread at a time, sort of like a Pez dispenser. You don’t have to reach way down into the bag to pull out a slice; the bag folds over the outside of the Bread Buddy so you just pull the bag down to bring more bread to the top. It makes every day sandwich eating in the kitchen easier, and it’s a bit hit at picnics or camping. The Singing Lady Sponge Holder Is The Best Sponge Holder! Color On The Doodle Tablecloth, Wash It, Then Color Some More!